Just after midnight on January 3, 1983, a small fissure opened within Napau Crater on Kilauea Volcano, spewing red-hot lava. Within hours, additional fissures stretched 6 kilometers (4 miles) down the volcano’s East Rift Zone. Thirty years later, the Pu’u ’O’o-Kupaianaha eruption continues, making it the longest eruption at Kilauea in recorded history. Since the eruption began in 1983, lava has poured almost continuously from a cluster of vents on the eastern flank. Through 2011, fresh lava had covered 124.6 square kilometers (48.1 square miles) of the Big Island of Hawai’i. Activity has occurred during 60 distinct events, separated by shifts in the location or behavior of erupting lava. Most of these events have been centered at Pu’u ’O’o, a volcanic cone built from successive lava fountains and flows. The 60th eruptive episode began in March 2011 and was ongoing through January 4, 2012. It consists of a lava pond within Pu’u ’O’o, and a steady effusion of lava that stretches 10 kilometers (6 miles) to the Pacific Ocean. 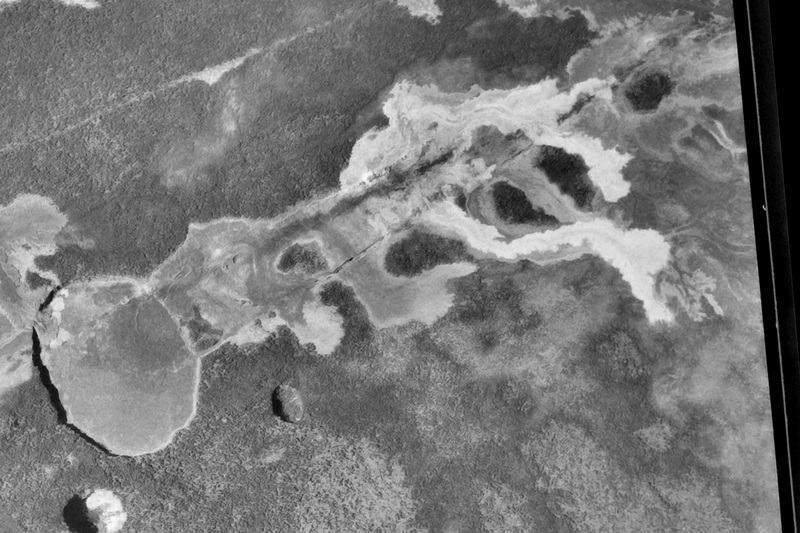 These images—a natural-color satellite image from June 6, 2011, and a black-and-white aerial photograph from March 25, 1977—show the landscape surrounding Napau Crater and Pu’u ’O’o. Lavas of different ages cover the surface. 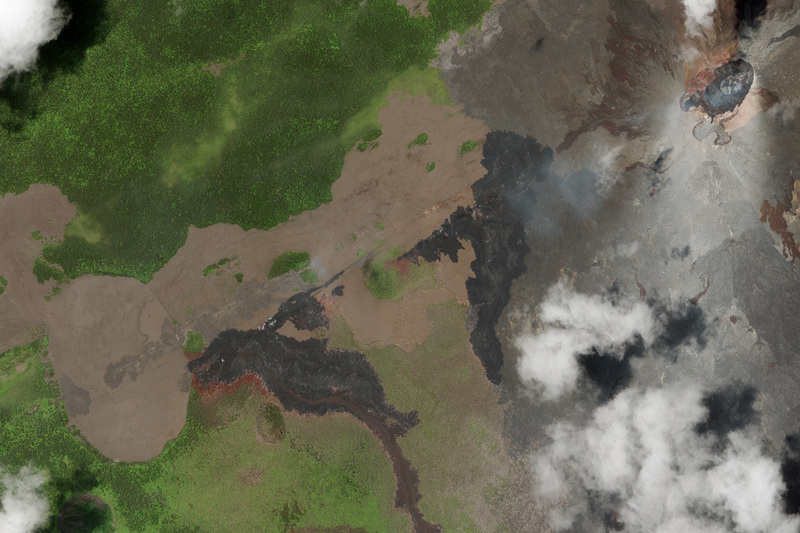 Lava flows that are more than a century old are covered by a dense forest (green in the 2011 image) of ohia lehua and tree ferns. 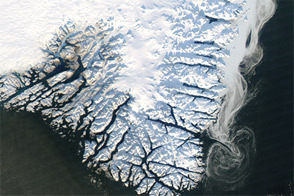 Flows from eruptions in 1965, 1968, and 1969 are much lighter than the forest in the 1977 image, but difficult to differentiate from one another. The 2011 image shows dramatic changes in the landscape. Weathered lava from the initial Napau Crater vent is almost indistinguishable from the older (1968 and 1969) lavas that cover most of the crater floor. In January 1997, a fresh line of fissures opened within Napau Crater, erupting lava during episode 54 of the Pu’u ’O’o-Kupaianaha eruption. 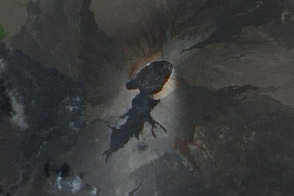 Additional cracks and fissures split the earth between Napau Crater and Pu’u ’O’o in the March 2011 Kamoamoa Fissure Eruption (Episode 59), spreading black lava through the forest. Scorched forest appears reddish-brown along the edges of the lava flows. 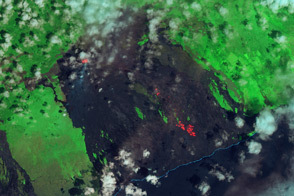 Since March 9, 2011, lava flows have originated from Pu’u ’O’o (image upper right). A lava pond is visible within the crater, and a system of lava tubes carries molten rock underground to the southeast. Brown lavas surrounding the crater flowed directly from the lava pond. These overlapping flows help illustrate the formation of the Hawaiian Islands as a whole. Each island was gradually built from many individual eruptions over tens of thousands of years—a blink in geological time. Kilauea is still in the early stages of its life, and will continue to erupt and grow. 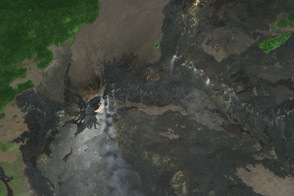 Satellite image by Robert Simmon, based on Worldview-2 data copyright 2011 DigitalGlobe. 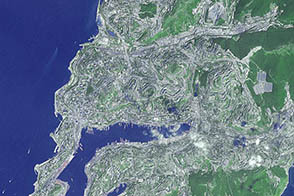 Aerial photograph from the USGS Earth Explorer. Caption by Robert Simmon. © All Rights Reserved: Use of IKONOS, GeoEye, and Digital Globe imagery must be coordinated with Digital Globe. 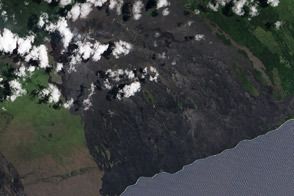 Overlapping lava flows on Kilauea Volcano illustrate the formation of the Hawaiian Islands. National Park Service. (2007, February 9) Forests of Hawaii National Park. Accessed January 4, 2012. Wolfe, E. W., ed. (1988) The Pu’u ’O’o eruption of Kilauea Volcano, Hawaii; episodes 1 through 20, January 3, 1983, through June 8, 1984. United States Geological Survey. United States Geological Survey. (2012) Pu’u ’O ’o-Kupaianaha Eruption statistics, 1983 through 2011. Accessed January 4, 2012.